EMBROIDERED BINDING. New Testament of our Lord and Saviour Jesus Christ. Newly Translated out of the Originall Greeke: and with the former Translations diligently compared and reuised, by his Maiesties Special Commandement. London: Imprinted by...Robert Barker...and by the Assignes of John Bill , 1633. Two twenty-fourmo volumes bound dos-à-dos (back-to-back) in one (4 x 2 1/8 inches; 103 x 55 mm). New Testament: 262 of 264 leaves (lacking final two leaves Y11 and Y12) ; Psalms: -330,  pages. Lacking title-page (sig. A). In this edition of the New Testament, sig. A2r has 15 verses. 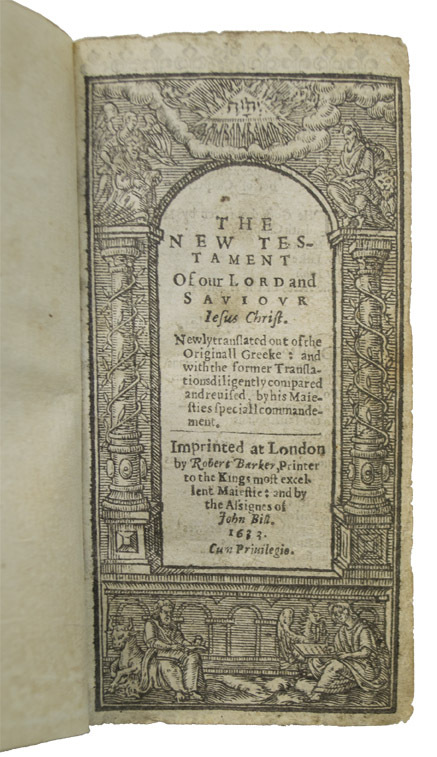 New Testament with engraved title-page. 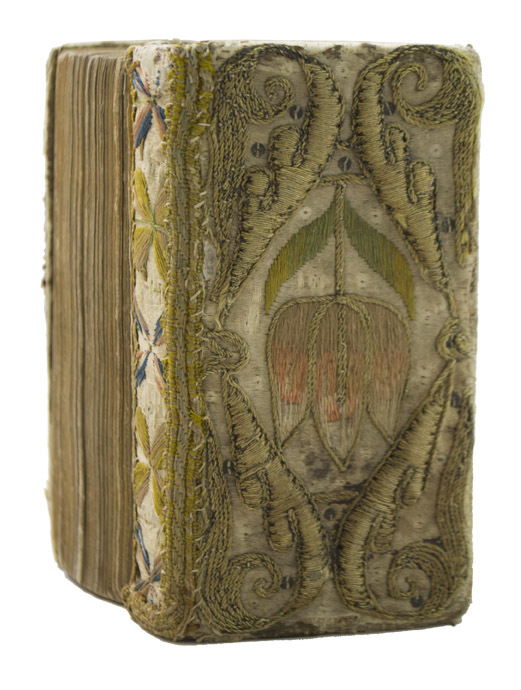 Contemporary London embroidered binding. Covers and spines uniformly decorated with with white silk embroidered with colored and golden thread. Both covers with ornamental framed tulip in salmon and green thread. Each spine with five four-petalled flowers in blue, pink and gold thread. All edges gilt. 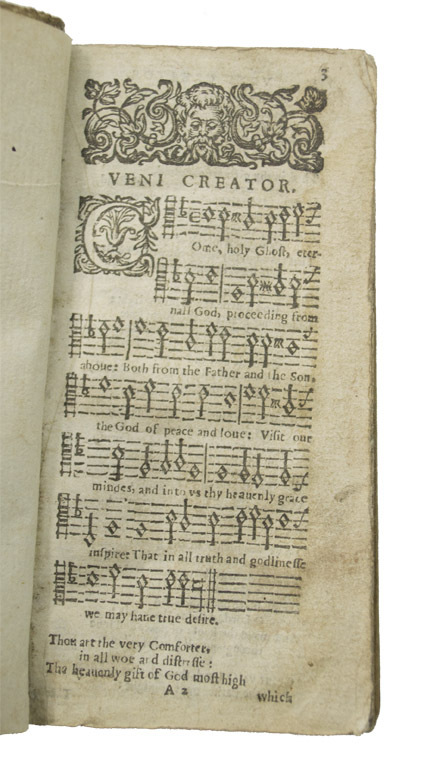 Previous owner's old ink signature dated 1711 on final blank of Psalms. Small portions of the embroidery worn away, or rubbed but still an excellent example, and better than most. 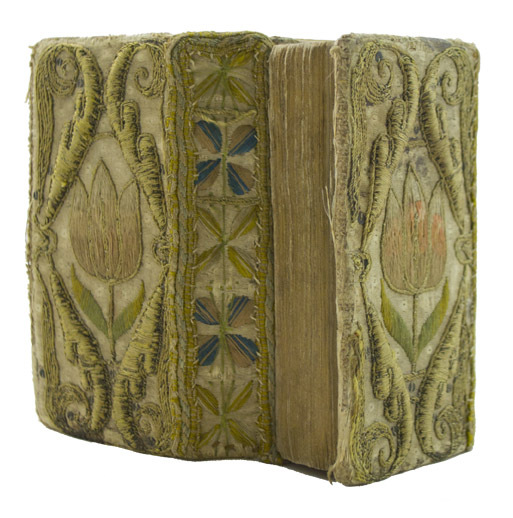 A characteristic London embroidered binding of the second quarter of the seventeenth century, rare in a dos-à-dos format. 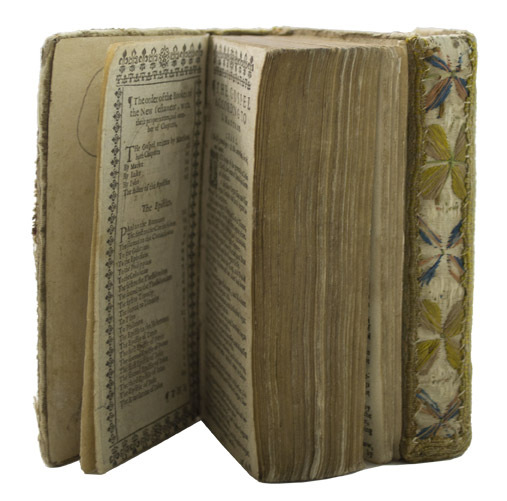 Although textile bindings of canvas and velvet were popular during the Elizabethan period as coverings for devotional books, the style reached its height during the stuart period.